Hitherto we know very little about the composer Vincenzo Albrici's session in Prague during his last years. Most of the traditional information concerning his stay in Prague is based on Western European 19th century writings, whereof the main part seems to be misunderstandings. The following description is made also thanks to local assiduous investigations 1999-2000 made by the Prague musicologist Marc Niubo. Albrici's life until 1682, when he was appointed music director at St. Thomas church in Leipzig is well investigated by the American Prof. Mary E. Frandsen, as far as the sources today known allows,(2) but Albrici's last time, in Prague, has until now been sparsely known to western musicologists. A look into Czech materials, all from the period before World War II, show that more light on Albrici's last creative period can be thrown. The Czech biographer Vogt mentions Albrici as the number one amongst the 17th century musicians. Today the resigned servant of the true music lovers"
Albrici got his musical education in the Jesuit school Collegium Germanicum in Rome. Queen Christina in Stockholm employed Vincenzo Albrici 1652-54. Later on they met in Stralsund, Hamburg and Rome,(8) some of the places where the Jesuits played important roles in the cultural, clerical, musical and political life. The Jesuits took a clear and active part in the converting and planning work for the queen of Sweden to leave for Rome. The Jesuits had a strong position in Prague and Albrici had obviously connection with them in Prague. Trolda give information that Albrici had some contact with the Jesuit College at the Salvation church at Clementinum. It is not unlikely to believe that the orgiastic construction activities during the last quarter of the 17th century in Prague, with its dominance of different Italian artists, made the demand for a well reputed music director such as Vincenzo Albrici as a natural matter. If so, it would not be the first time the former organist of Chiesa Nuova and Oratorio dei Filippini organist experienced newly performed clerical acoustic milieus. At the end of the 17th century Prague already had about one hundred churches belonging to different orders and communions. The Salvation church was built 1576-1659, the Italian chapel built 1590-1600 both in Clementinum, and Carlo Lurago and D. Orsi performed St. Ignatius 1665-70 at Karlovo námesti (Charles Square) as the Jesuits College baroque church of the New City (Nové Mesto). Also the Bethlehem chapel belonged to the Jesuits, which took over the ownership of the church (Counter-Reformation) 1627. One Jesuit college was performed 1674-90 close to St. Nicolas church in Malá strana, another was grounded in Clementinum 1556, later also the Jesuit Clementine University, later Charles University. After World War II Prague and the former Czechoslovakian republic has gone through deep historic political changes. The Nazi Germany occupied Czechoslovakia 1939, but compared to for example Dresden, Prague was never bombed during the war. After the war the Communists controlled the Czechoslovakian government from 1948. Liberal reforms, culminating in the "Prague Spring", were crushed by the Soviet-led invasion 1968. Mass demonstrations and public pressure ended the Communist era in Czechoslovakia 1989. 1 January 1993 the republic was separated in the Czech and Slovakia parts. Váchlav Havel was elected president of the Czech republic, expanded ties to Western Europe was made, as well as lobbying for membership of NATO and EU. A general view concerning certain archives such as the Archive of the Knights of the Red Cross or where all the monastery libraries are deposited, such as the Augustinians are today difficult to obtain. The latter are said to have been stored during forty years by the Communists after the war, but what really has happened to them after fifty years is still an open question. As a example the Museum of Czech Music in Prague has been closed for public visitors during one decade lately. Today there are at least thirty different music archives in Prague, and it seems that all Czech archives are taken part in a huge library and archive structure whereof a good part even can be investigated via Internet. But it will take a long time until the material is thoroughly registered and located in entities that easily can be surveyed. At the moment, according to the description above, it is only feasible to publish the titles and scorings of the compositions by Vincenzo Albrici said to be kept in the University Library together with those listed in the catalogue in Prague - RKr kn. 335 a - belonging to the Archive of the Knights of the Red Cross at the Franciscus Seraphicus Church near the Charles Bridge in Prague. (17) A similar catalogue in the City Library in Prague (Narodni knihovna) gives further complimentary information about the Prague-compositions mentioned by Trolda. Frandsen mentions some of the titles in the works lists over existent and lost compositions, the others are "new". Almost all of them are written for "2 chori" and several instruments. a 8 o 18 v.
2 chori, 2 viol., 2 vle, 2 cornetti, 3 trboni, fagotto, tiorba, organ. 2 chori, 2 viol., 2 vle, violone, 2 cornetti, fagotto, 3 trbni. 2 chori, 2 viol., 2 vle, violone, 2 cornetti, fagotto, 3 trbni, organo. The table above is a fusion of two catalogues that gives some clues about the material what concerns function, titles, catalogue numbers and scoring. Five titles can be found in Frandsen. Two sources to Jesu dulcis memoria are located in Uppsala VMHS 1:9 and 82:4, both with the scoring SAB, 3va, Bc., whereas the Prague list give 4 voci, 2 viol., violone - probably another composition. Several dates from 1661-62 in the Dresden archives indicate performances there. (25) The Prague catalogue, arranged alphabetically after the composer names, also has the year 1669 written attached to this title. O Jesu, Alpha et omega exists in the Bokemeyer collection(26) with the same scoring as one of the Prague catalogues (RKr kn. 335a), but the latter only give the number of vocal parts and not the specification of SAB. Three titles correspond by name to those works that has been considered as earlier lost,(27) Factus est prælium, Recordare mei and the Psalter setting Ad te levavi. All three titles occur 1662 as performed in Dresden. The six other titles have hitherto not been recognized in other archives or music literature in Western Europe. As mentioned above Trolda transcribed music from the offertory Confirma hoc, Deus 1938. Whether this and the other listed compositions still exist today in Prague has not yet been possible to investigate. Trolda's information concerning the two libretto textbooks he found in the Univ. Lib. 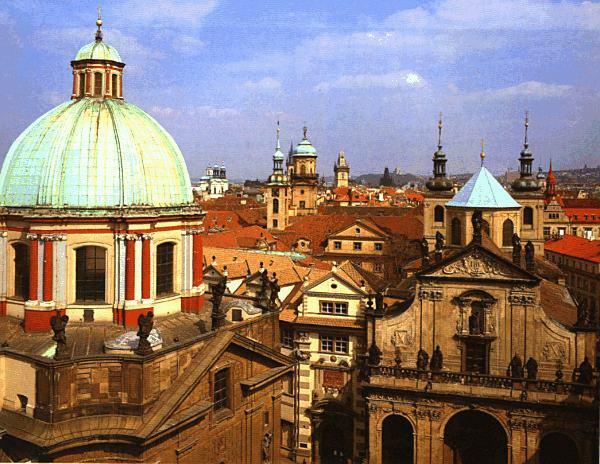 In Prague might anyway bear witness to an active composer in the middle of the 1680s in Prague. It is likely to believe that the two compositions from 1684 were performed in the Salvation church at Clementinum in Prague under Albrici, even if we do not know who wrote them. When did Vincenzo Albrici die? Bontempi, der 1680 auf Urlaub in Italien war, kehrte nicht wieder zurück; Albrici ging nach Leipzig an die Tomasschule, und von da nach Prag, wo er um 1690 starb. This statement indicates that perhaps more information might be found some day concerning Albrici's last time in Prague. Trolda does not mention wherefrom he's got the information that Albrici regarded the dean at Clementinum as his patron. However it bear witness to an active person in Prague. 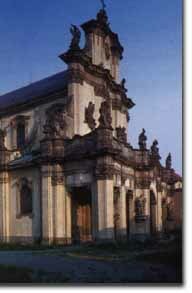 There is no - and has never been any - church building with the name St. Augustinian in Prague. The St. Augustinian congregation with its convent uses today, and has done so since 14th century together with the St. Thomas congregation, the St. Thomas church in Malá Strana, Prague. Other St. Augustinian churches in Prague are Marie Ascension and Charles the Great at Karlov (Charles court) and St. Catherine. There are indications that Albrici had connections with different churches and institutions at Clementinum in the mid 1680s. Evidently Albrici himself leaves a record telling us he had no employment at any of the courts in Prague. The most certain sign for Albrici's year of death is Sebastian Labe's printed Salium Millenarij Secundi from 1691. Labe's Salium also shows that Vincenzo Albrici had a pupil Anton Heisler in Prague. Perhaps eleven named compositions by Vincenzo Albrici, mostly with known scoring, might be left in Prague archives today and six of them has not been known by name earlier. Orders in Prague at the end of the 17th century. Die Musik in Geschichte und Gegenwart. Bärenreiter 2000. 1. This article is based on materials to be published in the authors coming thesis Vincenzo Albrici's Dixit Dominus - publishing music from the 17th century at Stockholm University. Thanks to economic support from The Royal Swedish Academy of Music, to whom I hereby show my gratitude, investigations in Prague has been possible to make. 2. See the article Albrici in The New Grove's Dictionary of Music planned to be released in November 2000. 5. The catholic Vincenzo Albrici happened to land up in the Lutheran Thomas School in Leipzig 1681. Secondary sources indicate that preferably economical rather than religious motives made a further stay in Leipzig impossible. 6. CYRIL; Casopis pro katolickou hudbu posvátnou a liturgii v Ceskoslovenské republice. Prague 1878-194?-?. 7. Trolda, Emil (Emilián); Vincenzo Albrici. Cyril LXIV. Prague [1938:1-2]. 8. Already according to the arrival ceremony celebrations in Rome, no less than the master of the Latin oratorio Giacomo Carissimi presented to Queen Christina Il Sacrificio d'Isacco (18/1 1656) in Collegium Germanicum. At this period Christina's home also was open for the oratorio developed towards the opera. 9. There is no proper St. Augustinian church building in Prague today. The St. Thomas church with convent inherits today also the St. Augustinians. 11. E. Trolda, Augustiniáni a hudba, in: Cyril LXII [1936:7-10, 29-35]. 12. Of the two different Augustinian orders in the 17th century - Ordo Fratrum S. Augustini ("obuti" or 'with shoes') and Ordo Fratrum Discalceatorum ('without shoes') - the first was situated in Malá Strana being the St. Thomas church today. 13. The Knights of the Red Cross. 14. Sebastian Labe, Salium millenarij secundi (Prague?) 1691. In Dresden Albrici had as far as we know three pupils known by name ­ Alberti, Krause and Kuhnau. 15. Krizovnici s cervenou hvezdou, but perhaps now in Muzeum ceské hudby (Museum of Czech Music), Prague, but evidently not in the Central State Archives (SUA). 16. Se Trolda 1938:1-2 that also includes a disposition of the offertory for the Pentecostal Sunday. The aria Dona, ut ardoris tui was printed as a supplement to Cyril 1938:1-2 by E. Trolda. 17. In Catalogus archivi musici domus Prageane Crucigerorum sum r.st., Pars II - Auctores extranei - are mentioned titles of compositions of Vincenzo Albrici (RKr kn. 335a, Nr. 4-10), today in the Museum of Czech Music. For this information I am very grateful to director Vácslav Babicka and his personnel at SUA Central State Archives, Prague. Marc Niubo mentions that another catalogue - Souborny hudebni katalog, Narodni knihovna CR, Prague ­ in a different way exposes the above-mentioned titles. 18. Referring to Souborny hudebni katalog, Narodni knihovna CR, Praha. Here the Roman figures have been changed to Arabic. 19. The catalogue gives no explanation of the letters A, C and D.
20. Trolda [1938:1] quotes a slight different scoring without violone. 21. It seems likely that this music also is written for Trinity Sunday, since the text is from Psalter Ps. 72:10 ­ "The kings of Tarshish and of distant shores will bring tribute to him; the kings of Sheba and Seba will present him gifts." 22. There is a possibility to find records for this music in the RKr kn. 335a-catalogue although it is not listed on the pages cited above. "Bei Prager Jesuiten wurde 1680 auch das italienische Oratorium Jephte von V. Albrici aufgeführt; andere Oratorien wurden in demselben Jahr von der Wiener Hofkapelle während des Aufenthaltes des Hofes auf der Prager Burg gegeben." "Einige Jahre lebte in Prag V. Albrici, wo sein Jephta (1680) als erste Oratoriumsauff�hrung gegeben wurde"
Buzga refers only to Trolda's article about Albrici in Cyril from 1938, consequently it is likely to believe that Buzga has made a miswriting what concerns the year 1680 in stead of the correct one 1684. 25. Frandsen, Appendix 1, p. 7. 28. During World War II the Cistercian monastery in Osek in the Czech province Krusne Hory, near the German boarder, only 65 km from Dresden, was a jail for nuns. The striking Borromini-influenced exterior from the rebuilt in the 18th century and names as Broggio, Santini and Corbelini show still another strong Italian influence in this region. The monastery in many ways seems to have suffered severely. Under the communist period it was an internment camp for monks and nuns who refused to abandon their religious calling. 30. Controlled by the author in situ 1999-08-05. 31. Münnig, Richard; Kuhnau's Leben. SIMG III, [1901/02:503]. 32. Gerber [1812-1814], Neues Lexikon, Article "Albrici". 33. This article will be updated when further information about the Albrici compositions in Bohemia appears.